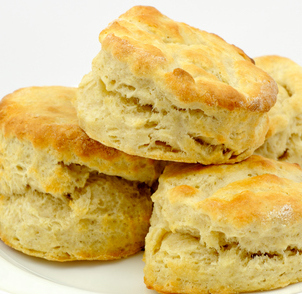 These sweet 'n tangy scones are wonderful naked straight from the oven. But no-one would say no to an extra slather of Nuttelex, or a dollop jam and cream either. For best results, make sure your oven is preheated. You can easily sub fresh lime for the lemon too. 1Pre heat oven to 220 C.
2Place flour & salt in large mixing bowl and gently rub in Nuttelex using finger tips. (Mixture should look like breadcrumbs). 3Next add all the milk and mix lightly to form a soft dough. 4Turn dough onto floured bench, and knead gently. Roll out into 2 cm thickness and using a floured cookie cutter or glass, cut into rounds. 5Place rounds on a greased tray and brush tops with extra milk. 6Combine lemon zest, lemon juice and sugar and sprinkle generously all over the tops of the scones. 7Bake in hot oven 12-15 mins.